Comics Experience Blog: COMMUNITY NEWS: Paul Allor Interviewed on CBR! 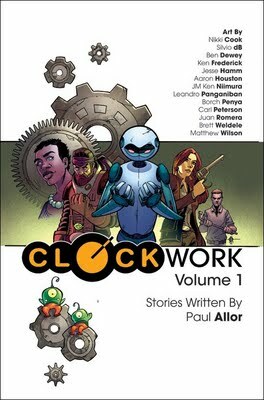 Comics Experience Writing alum and Creators Workshop member Paul Allor was recently interviewed by Comic Book Resources (CBR) regarding the release of his first book, a collection of short comics titled Clockwork, Vol. 1. In the interview, Paul discusses how the approach he took to Clockwork originated with Andy Schmidt's Introduction to Comic Book Writing course, in which students write a complete 5-page comic book script with a beginning, middle, and end. "In that class, Andy told us that writing a strong and complete five-page comic is actually harder than writing a longer work. I really took that to heart. So, after the class ended, I decided to continue honing my craft on stand-alone five-page stories. Clockwork, Volume 1 features 12 of them, and another 12 are currently in production for Clockwork, Volume 2. Read the full CBR/Robot 6 Interview with Paul Allor here. Anyone who enjoys anthologies, great comic book stories and art, or has an interest in studying complete, short comic book stories should definitely check out Clockwork! The stories inside range from westerns to outer space, and take you from death row to a child's home. Paul recently wrote about the lessons learned from Comics Experience in producing his book in a special guest blog. You can read Clockwork, Vol. 1 online for a limited time at www.clockworkcomic.com, and can order the print version in the Clock Shop.